I’m not often vocal about my decision to turn veganese for a few reasons. One, I’m not often in the mood to get into a discussion about why/how I made my choice. Two, once people know I’m vegan, my food choices get scrutinized (“PIZZA ISN’T VEGAN, YOU KNOW” or “That’s all you’re eating? How sad.”). A lot of the time, though, opening up about being vegan (or trying to be) can be a beautiful thing. I learn a lot, I get asked a lot of smart questions, and I get introduced to foods and products and other vegany things. I posted about Hail Merry’s Miracle Tart before. It was good, but I wasn’t really left wanting more. They have definitely hit it out of the ballpark with their Grawnola product, though. Joelen brought me a couple bags of their orange cranberry blend. As you can see on the package, it’s raw, gluten-free, and vegan. The mix contains almonds, buckwheat groats, pecans, dried apples and cranberries, sunflower seeds, walnuts, flax seeds… and it’s flavored with maple syrup, orange juice, vanilla, cinnamon, and sea salt. It occurs to me that one would easily make this mix on their own, but I’m going to leave the mixing and dehydrating to the experts. 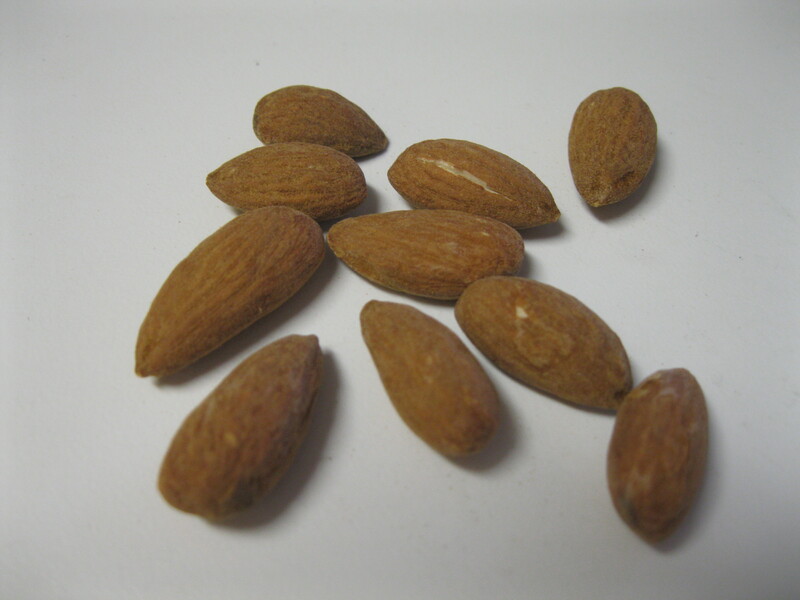 The Grawnola is much more exciting than plain nuts, satisfies my sweet cravings that usually have me reaching for chocolate, and is just plain fun to eat. I’ve only tried it straight out of the bag, but I imagine that it would be awesome with mixed in with vegan yogurt or ice cream. It’s great when I’m having a snack attack or as a quick pick-me-up after an intense work out (read: leisurely walk on the treadmill). 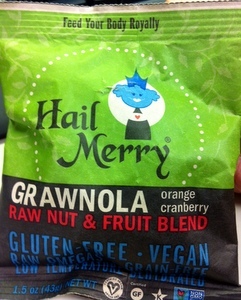 Look for Hail Merry Grawnola in stores or buy directly from them on their web site. Hail Merry also has a great presence on Facebook, so go Like them. 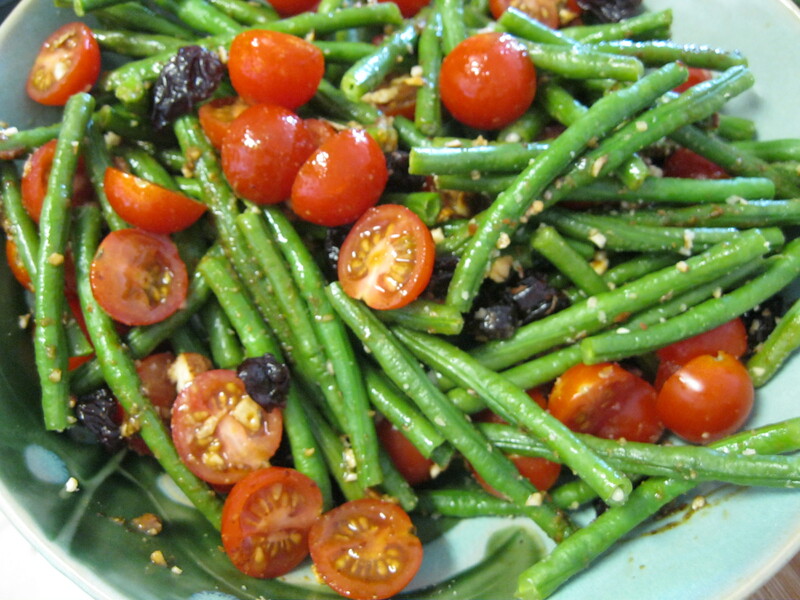 Double Cherry, Almond and Long Bean Salad! 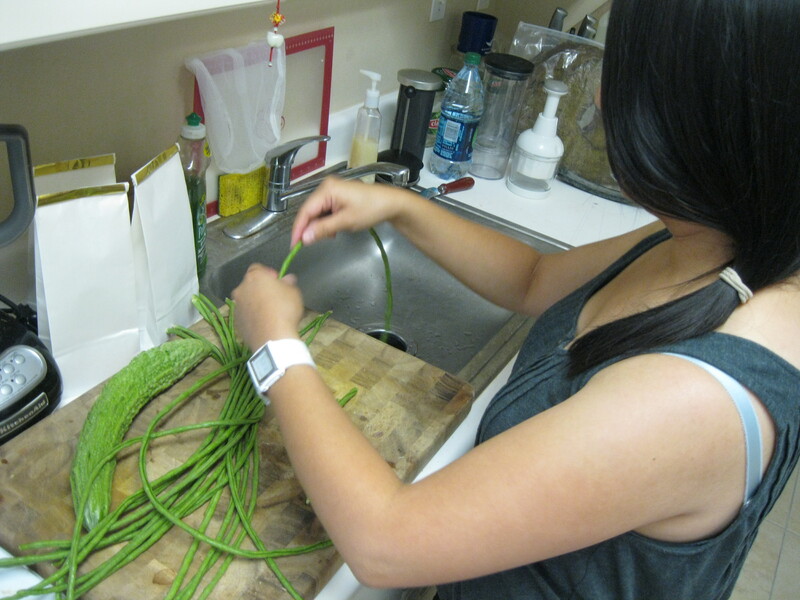 Melissa brought us some GORGEOUS long beans from her Dad’s garden. Green beans are easier to find in your supermarket but long beans have a subtly sweeter flavor. Here she is below, breaking off the ends and snapping them into bite sized pieces. Melissa blanched the beans by steaming them. I tossed together the fruits and veggies and dressed it with 3 tablespoons of balsamic vinegar that I whisked together with a tablespoon of Dijon mustard. This salad disappeared fast: sweet fruits and veggies, savory nutty almonds and tart dressing. The textures were contrasting and very welcome and this is a light filling salad that’s beautiful to boot! We hope you get to try it. This is Melissa, Christie and Brent, signing off! I’m weirded out by eggplant that I see in grocery stores. They never look as pretty or feel as nice as the ones that grow in my Dad’s garden. 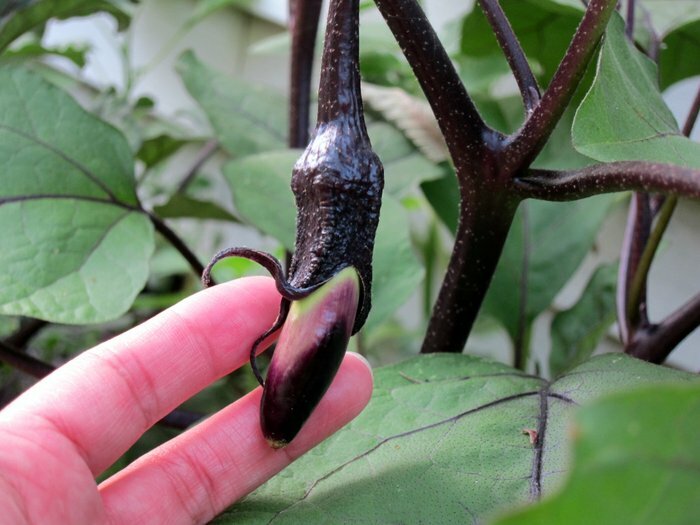 I took this photo about three weeks ago; we have a mess of eggplants now. Eggplant is superb. You can use it in a variety of ways and in a variety of styles (Asian, Mediterranean, Italian, etc.). We “roasted” some eggplant by broiling them whole until they were soft and then peeled the skins. 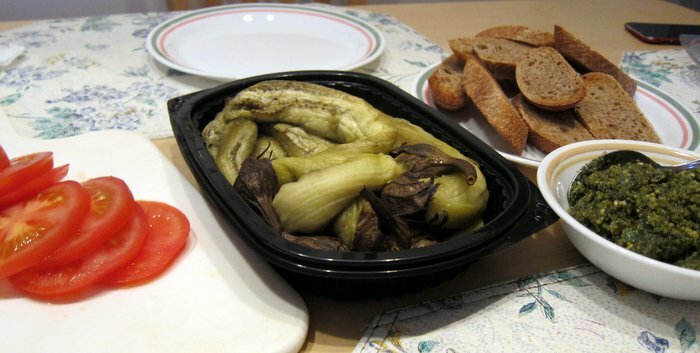 You can refrigerate the roasted eggplant for use later, which is what we did in this case. Another garden goody is fresh basil. 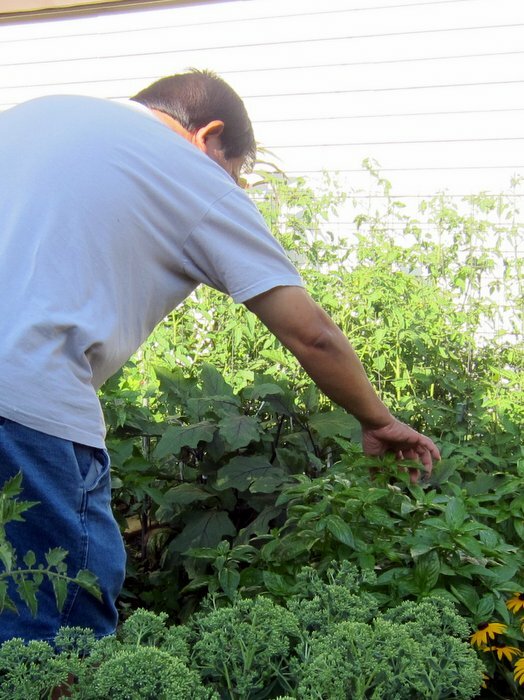 Here’s a pic of my Dad picking some basil for me for this recipe. I needed it for the pesto! 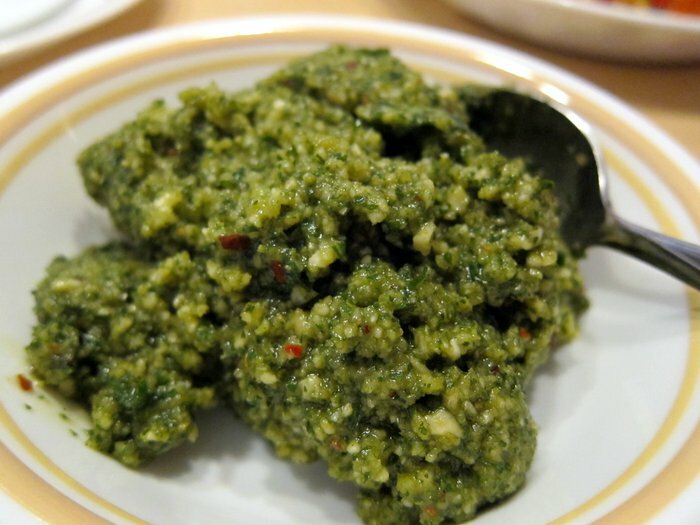 Look at this beautiful pesto! The non-vegans in the house thoroughly enjoyed it so I am extra proud of it. Get all your ingredients together on the table. 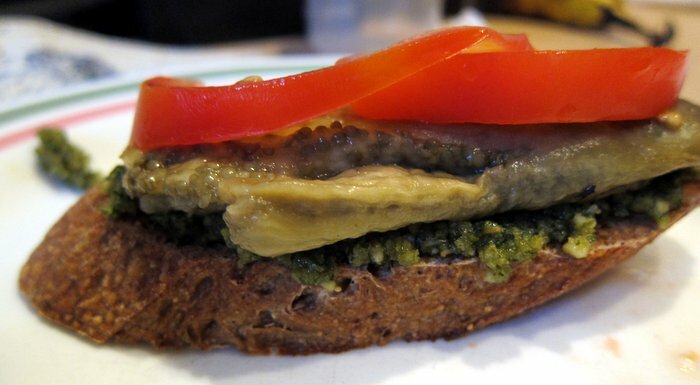 To construct the sandwich, take your toast, spread pesto on it (it’s okay to be liberal with the amount you use–go crazy! ), mash some eggplant on that (no need to reheat if it’s chilled), and top with tomato. 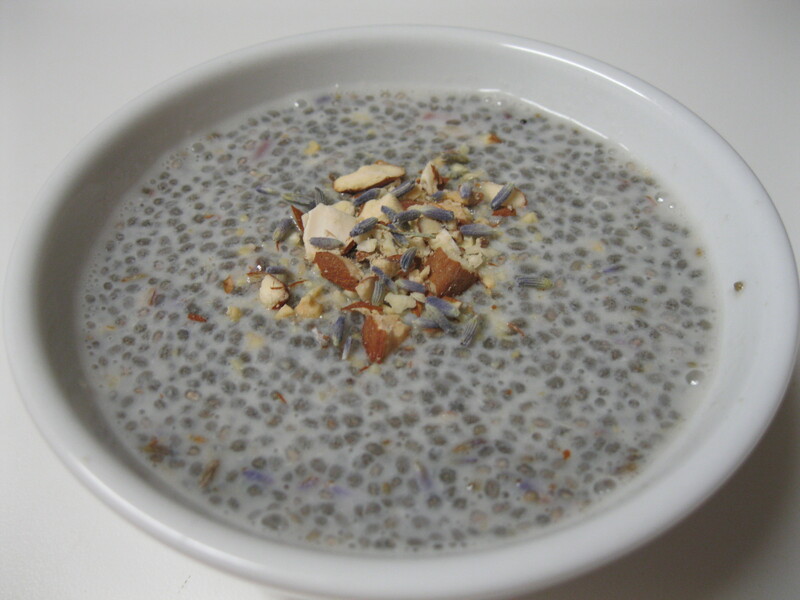 I combined the seeds, syrup and almond milk and set it aside for about half an hour. While the chia were absorbing the liquid, I put some roasted almonds in a paper bag and bashed them with my favorite rolling pin. It was very cathartic. I mixed them into the pudding with the lavender flowers, saving some of each for a garnish. This is a refreshing snack that I feel like I should be enjoying with a cup of Earl Grey tea. Some of you might be asking yourselves what sort of syrup I use for my lavender and rose flavoring. 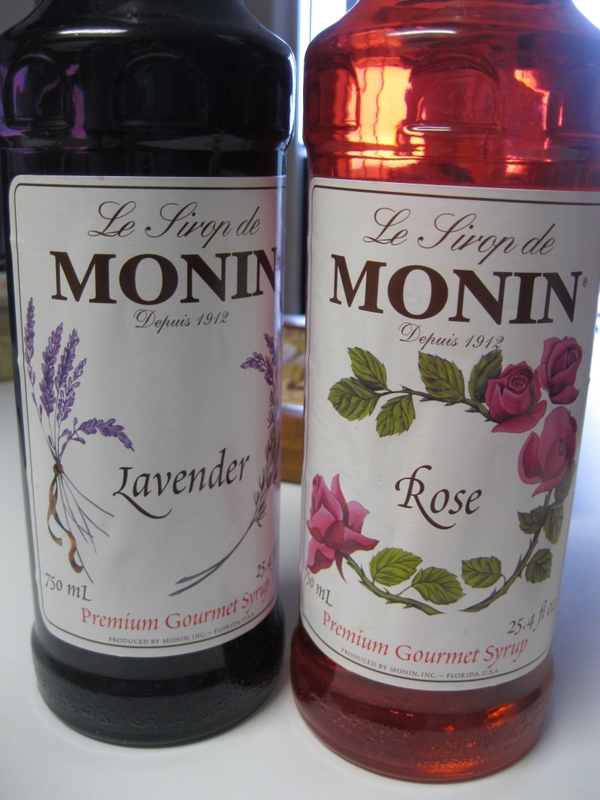 Monin makes vegan syrup in organic and conventional varieties as well as sugar free syrups. I’m a big fan of their line. Granola: not just for hippies and hikers anymore! 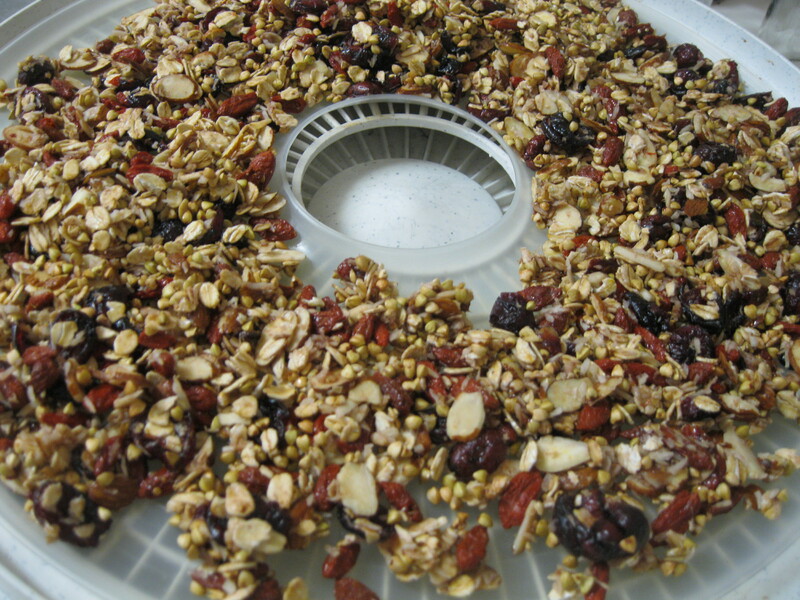 Food dehydrators aren’t just for apple chips and other dried fruits and veggies. They’re also great for making your own granola. Brent and I have a generic recipe that’s pretty much fool proof. 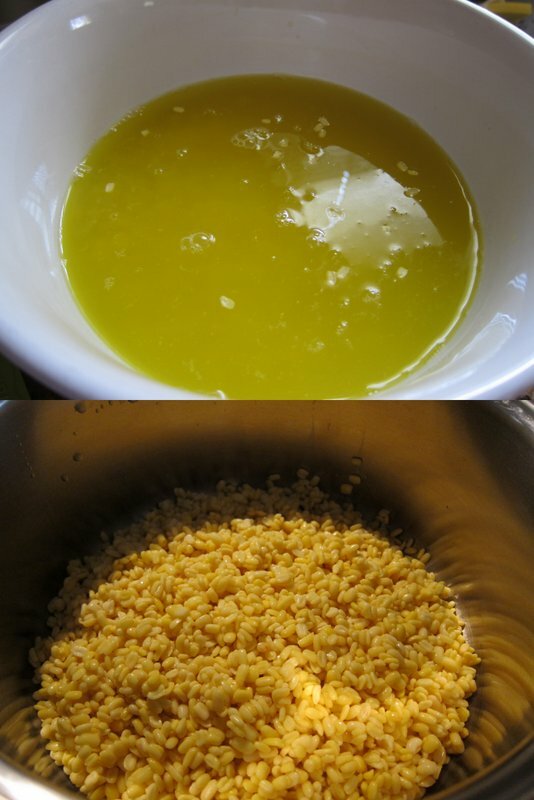 Combine the following in a large bowl and mix in the jam until the mixture begins to stick together. Spread it out on a drying sheet and dehydrate 4 hours. My dehydrator doesn’t have any heat settings or a timer. If yours does, don’t worry: this is fool proof, remember? Buckwheat groats add a lovely crunch even if you decide not to add jam and dehydrate the mixture. When we make that instead, we call it museli. It’s got less sugar and is just as delicious. We put museli and granola over soy yogurt, fresh fruit, non-dairy ice cream or with regular cereal. It’s also great by itself as a snack. Buckwheat, oats, nuts and dried fruit are loaded with balanced protein, soluble and insoluble fiber, iron, essential fatty acids, important trace minerals and lots of vitamin C and B vitamins. It’s also versatile: you can add a pinch of cinnamon if you’re so inclined; switch jam for rice nectar or maple syrup; add any fruits you like – apples and bananas are great! Use quinoa flakes instead of rolled oats… okay, now I’m hungry. This is Brent and Christie, signing off! Hopia is a Filipino dessert that is typically made with mung bean, but is also made with ube (purple yam) or baboy (pork, which I found nasty even in my pre-vegan days). Hopia is very possibly my favorite Filipino dessert. The only thing that makes traditional hopia non-vegan is the egg wash that is brushed on the pastry before it is baked. I bought some yellow mung beans and decided to try making my own hopia. I’m very much not thrilled with how it turned out so I won’t go into specifics on ingredients, but I’m posting this because I like seeing how my cooking skills improve (or not) and want to learn from my mistakes. Someday, in the next 40 years or so, I will get over the trauma of this experience and try making it again. 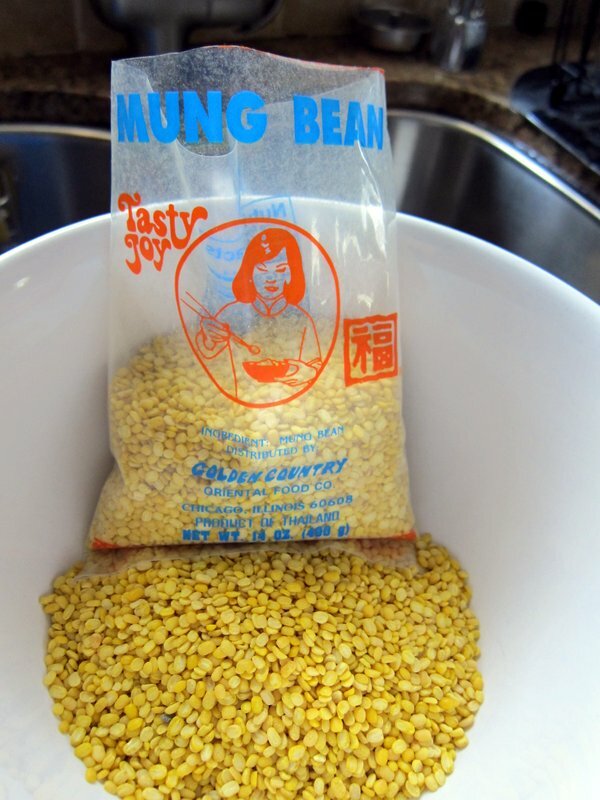 First, I got my mung beans and soaked them for about 4 hours. Three hours in, I started working on my dough. I despise flour and dough and proportions and mixing. 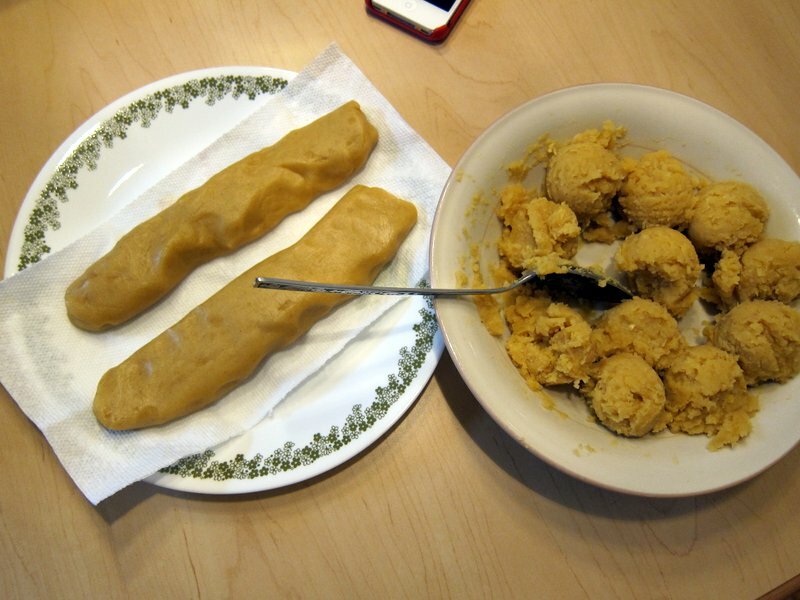 Two doughs are required for hopia. 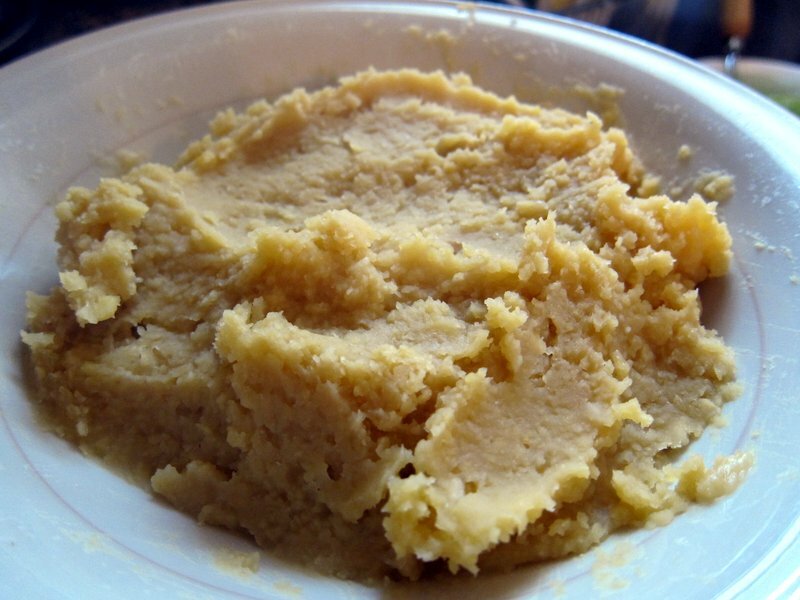 Pictured above is Dough #1. 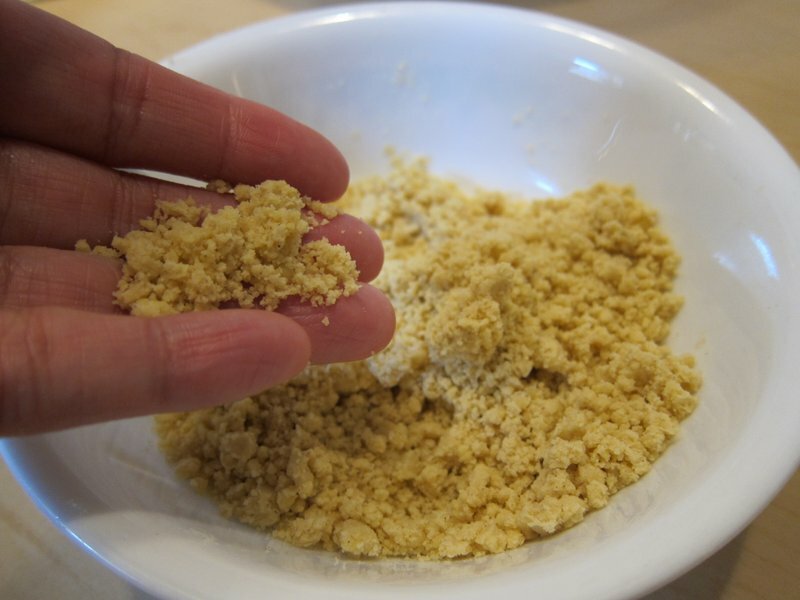 It’s flour and oil, proportioned and mixed into loose crumbs. I honestly don’t know if this is how Dough #1 was supposed to turn out. Dough #2 was more traditional. By this time, I was so tired and annoyed (it took two tries to get both doughs right) that I didn’t bother to take photos. Basically, you’re supposed to flatten Dough #2, sprinkle it with Dough #1, and then roll it into a log. Uh, yeah. That didn’t happen. I just ended up mixing the two doughs together. Four hours passed. I drained and rinsed the mung beans (yes, the water turns yellow). 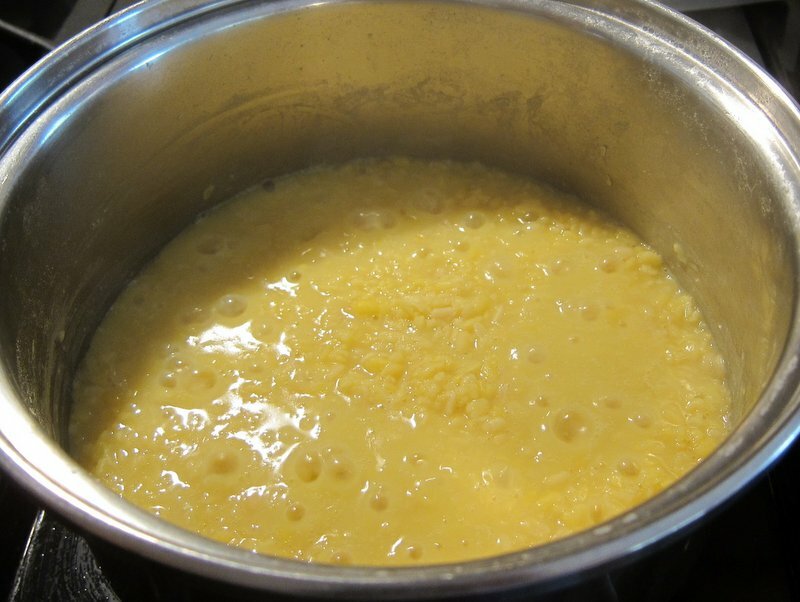 Then, I put the mung beans in a pot, added enough water to cover it, and brought it to a boil, mixing until the beans got soft and it started to get pasty. Keep an eye on the beans! I took the beans out, added salt, and then tried mooshing them into a paste. That did NOT work, so I put them in a food processor, which did the trick. I added the agave nectar and then microwaved the filling to dry it out. I dried it out until it was about the consistency of mashed potatoes. I thought I was a genius, but I had to keep in mind that I would still be baking this; my filling ended up being pretty dry. Note: I could have just eaten this with a spoon at this point. I took an ice cream scooper and formed the filling into balls so that I would know how many piece to divide my dough into. Now it was time to make the pastry. 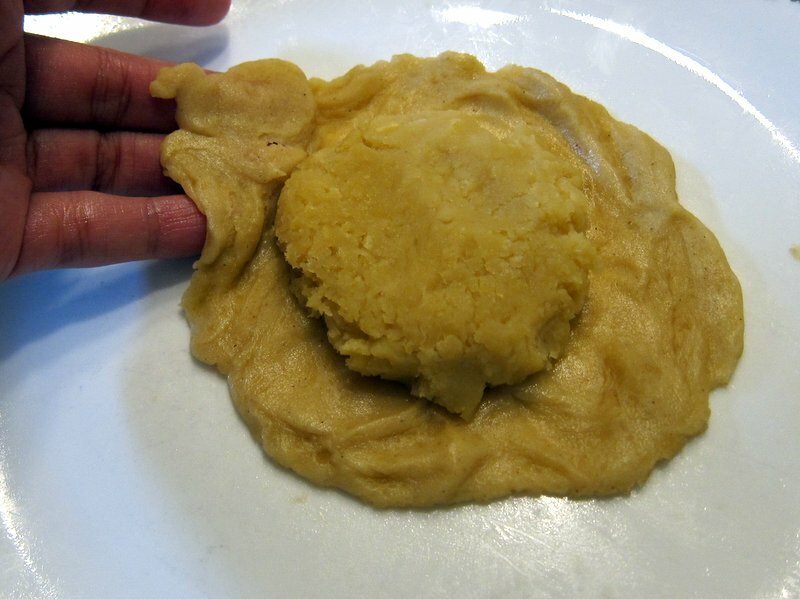 In theory, you’re supposed to flatten the dough into a very thin layer, place the filling on top, and then pick up the rest of the dough to cover it up in a ball and flatten it. I tried! They did turn out pretty, in my humble opinion. 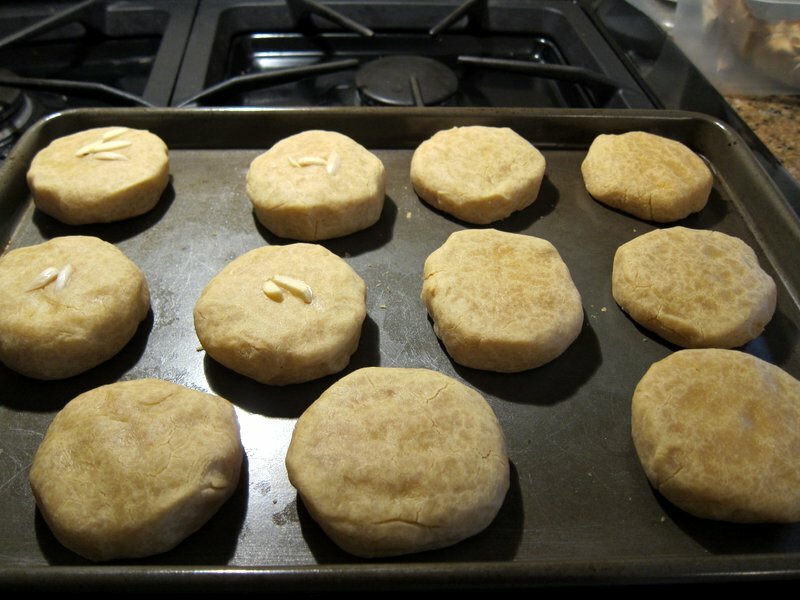 I brushed the tops of the hopia with almond milk and then put them in the oven. Here are the finished hopia, done and baked. I added some almond slivers to a few of them, and put almond slivers on top to indicate so. 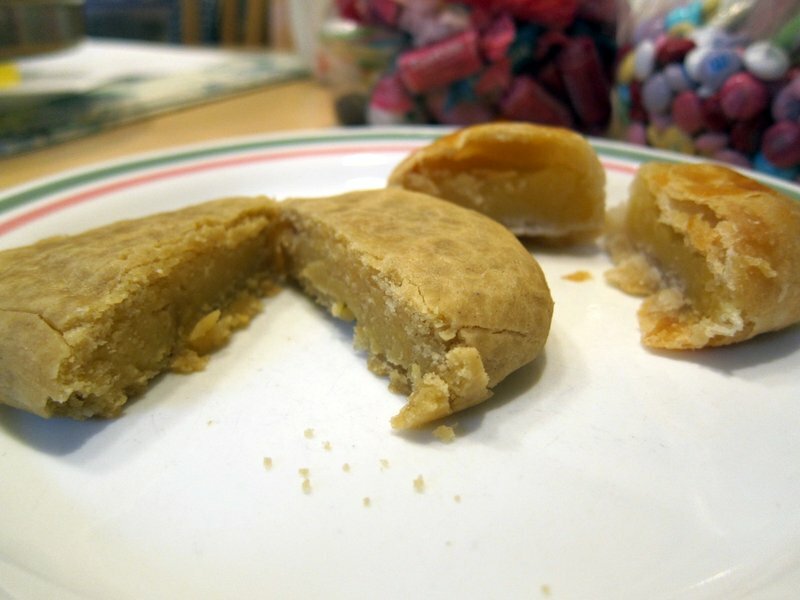 The hopia were OK – the filling tasted sweet enough but could have used more agave nectar. I’m reluctant to try stevia and I even have some reservations about agave nectar, but I didn’t want to use regular sugar. Coincidentally, my Dad showed up with real hopia, so here’s a comparison. It’s a little hard to tell, but the real hopia has a flakier pastry and yellower filling. Anyone have any advice for my next try? I am completely baking-challenged! Thankfully, I know an awesome lady who makes wonderful hopia, so I will happily eat hers for the time being (removing the top later to avoid the egg wash). Squash “ribs”, green beans, and cilantro lime quinoa! People often cite being vegan as being too difficult as a reason for continuing to eat meat, dairy and eggs. I was ruminating on this idea, this afternoon as I was thinking of what I would prepare for dinner this evening. I picked a handful of ingredients: green beans, butternut squash and cilantro. These were left over from other things I’d prepared this past week. 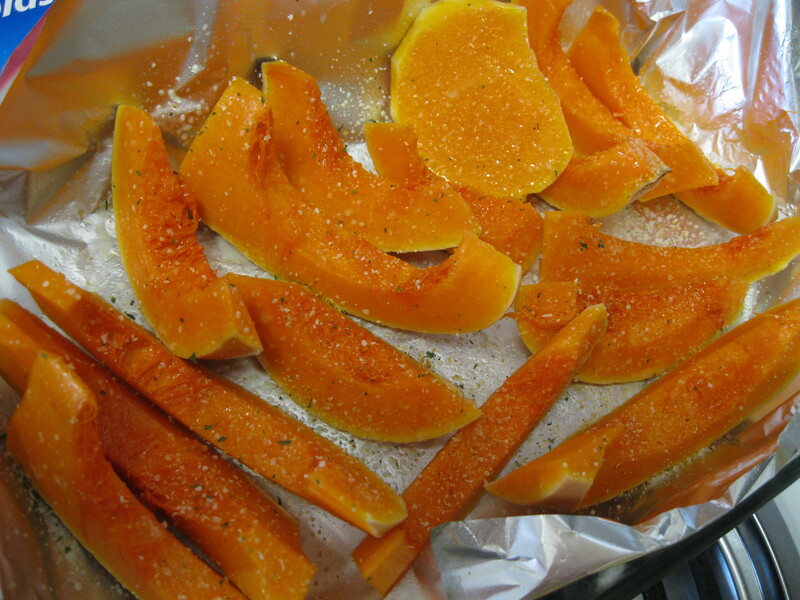 I sliced up the squash, leaving the skin on, sprayed it lightly with olive oil and sprinkled it with sea salt. I put it into the oven on a tinfoil lined baking dish and set the timer for 30 minutes at 350F/175C. 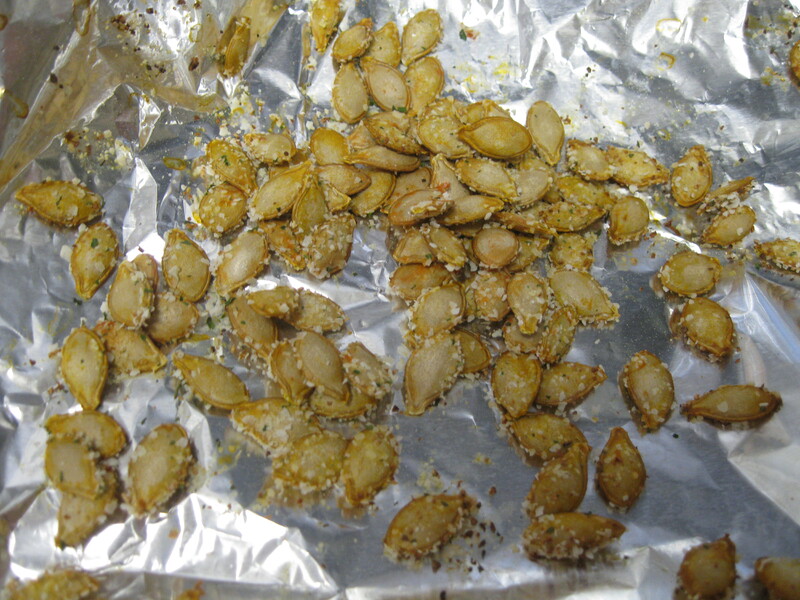 I also put the seeds from my squash onto another piece of tinfoil with a light sprinkling of garlic salt and checked every few minutes or so until they were crispy and delicious. You can do this with pumpkin seeds or the seeds from spaghetti squash as well. I snacked on these while I was tending the rest of the meal. While that was happening I washed my green beans and snapped the ends off each one. I put them in a covered steamer and waited until they were BRIGHT green. This takes 8-12 minutes, because I like mine crispy and green. 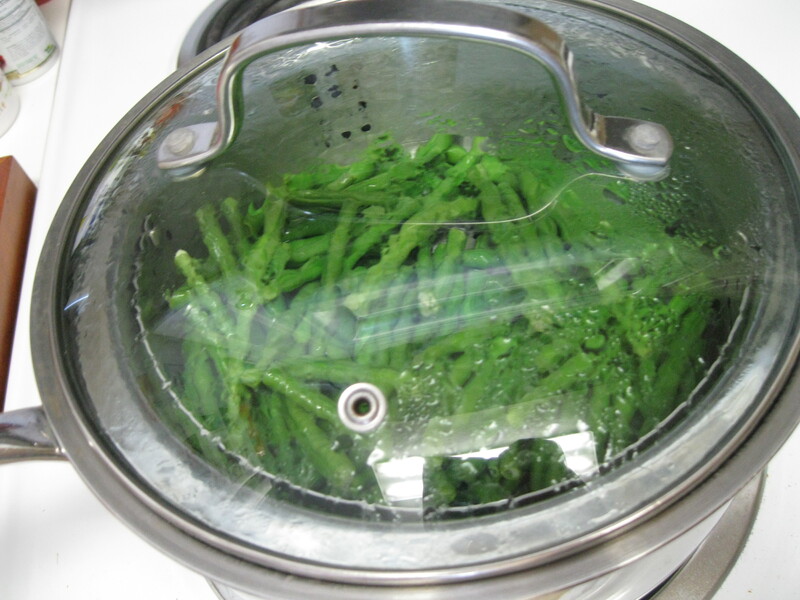 As soon as they got really bright green, I took the lid off the beans and took them off the heat. I put the quinoa and water into a microwave safe bowl and microwaved it for a minute. I stirred it and added the bouillon cube and microwaved for another minute. I stirred it and added the sun dried tomato and microwaved for a minute. I stirred it and added the onion and microwaved it for a minute. I microwaved for another minute and then all of the liquid was absorbed and I stirred in the cilantro. I squeezed some lime over it before serving. 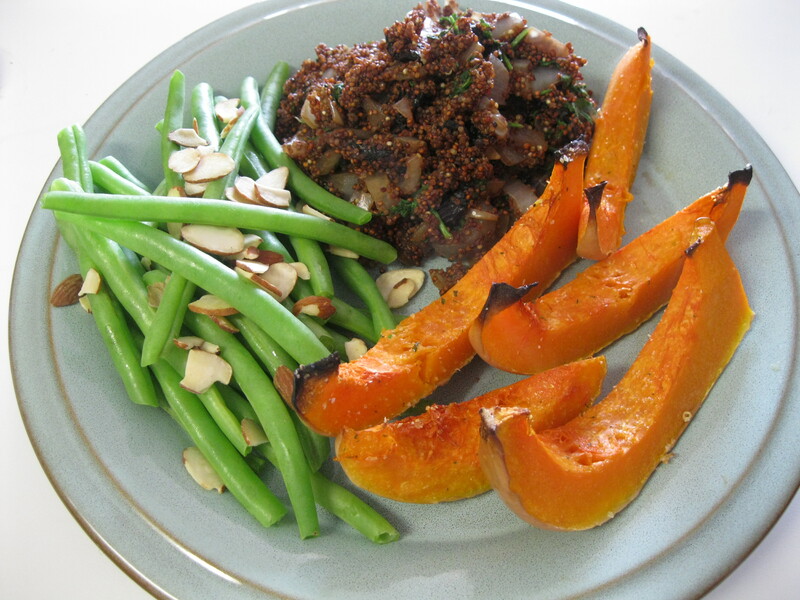 I placed the green beans on the plate and sprinkled some almond slivers over them (omit these if you’ve got a nut allergy and use the baked squash seeds instead). I ended up drizzling some balsamic vinegar on them too but that’s not in the picture. I was starting to check that the squash was tender with a fork at this point and as soon as it was ready, I put the squash on the plate with everything else and because I didn’t take off the skin, I ate them like they were ribs… except there was no hunks of fat or gristle to get in the way of my eating pleasure. As I ate, I thought about how I made something really healthful, beautiful, fragrant and tasty in 40 minutes. As far as I’m concerned, the best food nourishes your mind and your body. This is Christie, signing off. I love Brussels sprouts. I rarely ate them growing up. 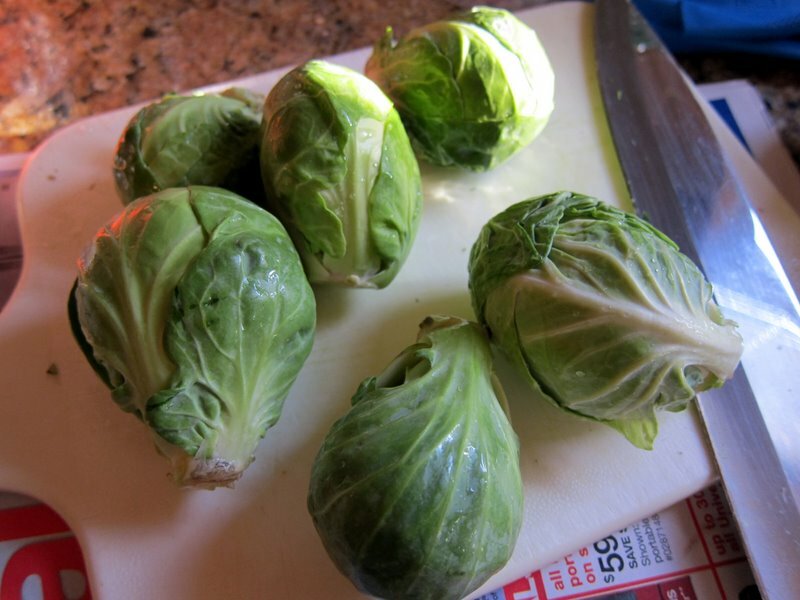 In fact, all I knew about Brussels sprouts was that I wasn’t supposed to like them. The first time I saw them, I remember thinking, “those aren’t sprouts!” Aside from being delicious, these little guys are so freaking good for you, they’re easy to prepare, are extremely versatile, and they’re seriously cute. For lunch today, I decided to make some of Christie’s almond crusted tofu. 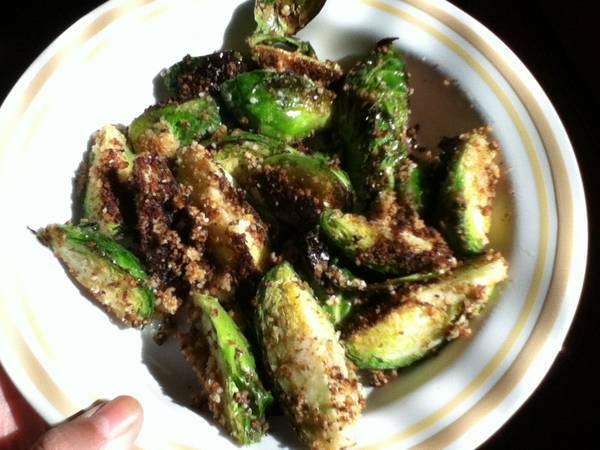 I was about to dump the leftover breading when I got the crazy idea to make some almond crusted Brussels sprouts. First, I added about 2 tbsp of granulated garlic to the breading. 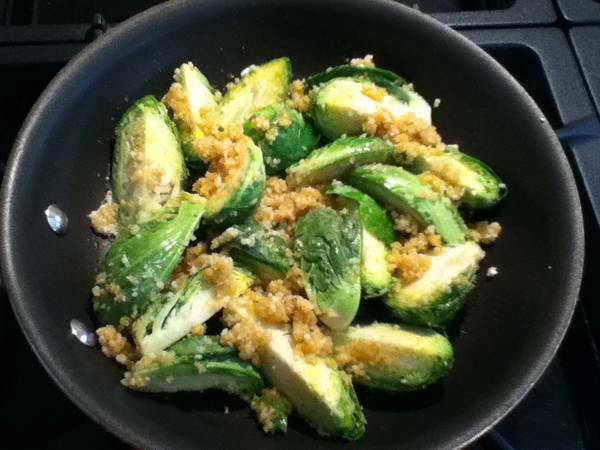 Then, I rinsed and quartered the Brussels sprouts, and then placed them right into the dish with the breading. I drizzled some olive oil right into that dish as well, to help the breading stick a little. 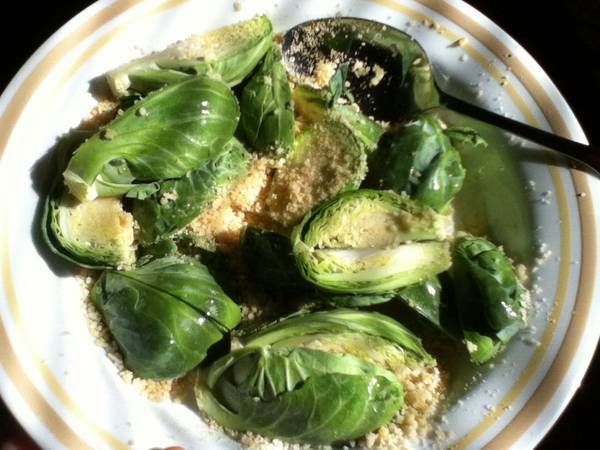 I dumped the sprouts into a frying pan, and cooked them for about 8 minutes, flipping them over halfway through. Between these and the tofu baking in the oven, my kitchen smelled like nuts. The breading burned a little but, but I didn’t mind. They were nice and crunchy, and the dish itself was really flavorful. Some of the outer leaves were really crunchy… like Brussels sprouts chips… yum… Anyway, I totally stuffed my face with these, the tofu, and some brown rice. My belly is happy, and so am I. 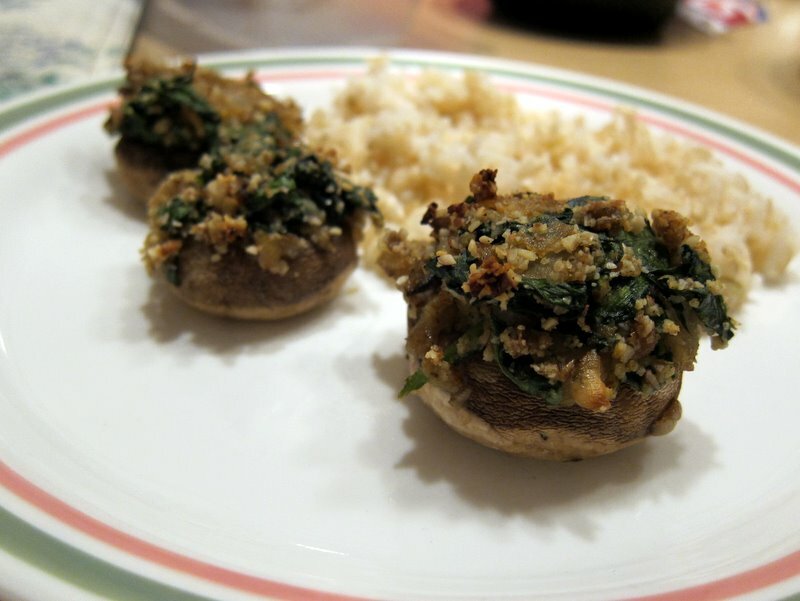 Stuffed Mushrooms? Shut Your Mouth! I Mean… EAT IT! Me to Younger Version of Myself (YVoM): Guess what? I made stuffed mushrooms today. YVoM: Shut up! Who do you think you are, Giada DeLaurentis or something? Me: Haha. No, I’ve gone vegan and I actually cook now! Me: I know, it’s unbelievable. YVoM: I can’t believe you cooked stuffed mushrooms. I can’t believe you’re vegan. Me: Listen to me. We are stronger than we think! YVoM: Grrrreat, Future Me is still sentimental and introspective. YVoM: I still blog? Mmmkay. Hey, I need a photo of those mushrooms to post on the blog. Talking to yourself is normal, right? It doesn’t matter. The point is, cooking and eating vegetables is my new normal. I had some mushrooms that I bought over the weekend, and I really wanted to cook them today. So I Googled “mushrooms recipe vegan” and found this recipe from Healthy Vegan Recipes. It’s so easy and versatile and delicious! The stuffing is basically made up of spinach and ground toasted almonds with onions, garlic, and chopped up mushroom stems. I can’t wait to try it out with different spices and nuts. Oh, by the way, I burned my nuts when I toasted them the first time so be sure you watch them. Heh, burned nuts. 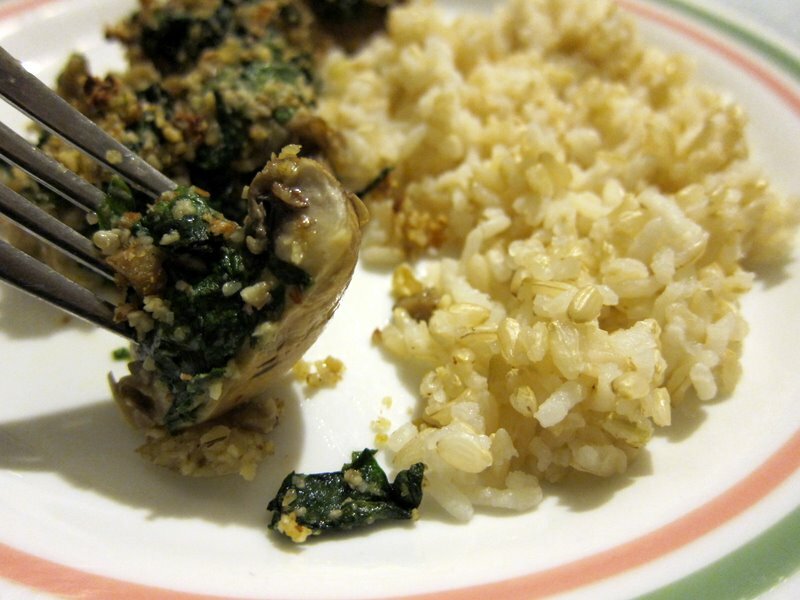 I ended up with 10 stuffed button mushrooms and ate seven with them with some brown rice. Dinner was served!